At hedgehog lab, we've long forecasted that immersive technologies will play a disruptive role across multiple industries. As augmented reality (AR) and virtual reality (VR) begin to crawl their way up the slope of enlightenment, sectors such as entertainment, healthcare and training are already benefiting from the impact of the technology - with their effect only likely to increase. An area that looks as though it could be next in line to feel the influence of XR's rise is property. Use cases for AR and VR in private housing appear pretty clear, particularly in sales and marketing where innovative startups and established names alike are beginning to put immersive experiences at the centre of their offering. Arguably the most common usage of immersive technology in property comes in virtual reality house viewings, which are allowing prospective buyers to view homes from remote locations. Enabling saved time for customers, increased efficiency for estate agents and even the ability to customise the surroundings to the customer's preferences, the argument for investing in VR for property companies appears relatively clear-cut. In social housing, viewings often aren't conducted at all. While generally open to innovation, associations will be wary of duplicating ideas that work in private housing, and perhaps rightly so. Though both sectors can learn from each other in some areas, it would be foolish to assume all that works in one sector is applicable to the other. Nevertheless, immersive tech is finding its place here too, helping providers to engage stakeholders during design and build phases. VR is being used to help boost buy-in, improving understanding in how new developments will affect current households and even allowing the opportunity for future neighbours to have their say in how a new a development may look. House viewings are set to be redefined by immersive technologies. However, where it should be these benefits that are the drivers of immersive technology's growth in property, it appears instead that logistical reasons are forcing property players to move to invest in virtual and augmented reality. Current demand requires 300,000 new builds each year. At present, there is an annual deficit in what is being delivered of over 80,000. Most worryingly, this is a gap that is growing. Though 87% of the sector feel that there is a sufficient appetite to innovate and solve the crisis, only 14% believe enough is being done to tackle the issue. In fact, Savills' 2018 Housing Sector Survey revealed that housing associations believe the sector's main priority to be delivering more homes. This is to the surprise of some, who feel aspects such as fire safety should be atop of the agenda in the wake of the (very much avoidable) Grenfell Disaster. That new housing remains the primary concern only highlights the seriousness of the issue. Effects of the deficit are already being felt. In May 2018, Prime Minister Theresa May declared levels of homelessness in the United Kingdom as "a source of national shame". Underlining the urgent need for change, the government has committed to eliminating rough sleeping within a decade, pledging more money to mental health and addiction support and threatening punishment for those sitting on valuable land without activity. Housing associations are also adopting a proactive approach to tackling the problem. At hedgehog lab, we've just agreed on a partnership with Home Group, a social enterprise that is turning to innovation to imagine the home of the future and identify ways to build sustainable, high-quality housing. The company's Innovation Village is helping explore how modular building methods can help in tackling the deficit and determine the role smart technologies will play in social housing. We're helping Home Group to lead the fight against the housing crisis. 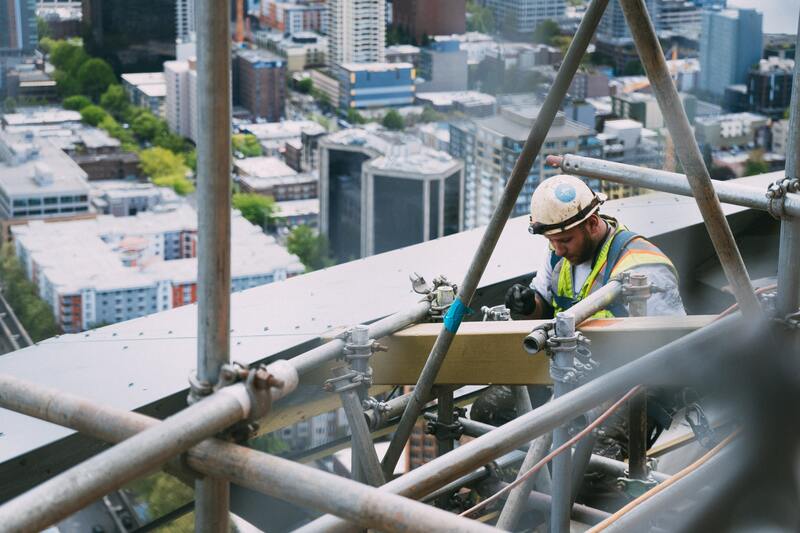 You might be forgiven for assuming that high demand spells good news for those in construction, with desire for such services naturally higher. But with Brexit looming, so too is a crisis of confidence in the industry's capacity to meet demand, with the prospect of losing up to 200,000 workers naturally striking fear into housing associations and property developers alike. Though some may be fearful about the future, housing providers can take some solace from the present, as the construction industry continues to move further away from an outdated perception that technophobia is rampant through its core. Construction firms are embracing technology like never before. Recognising rewards such as increased safety, reduced costs and pinpoint accuracy, it's quickly becoming clear that tech represents a wise investment. Like their property-providing cousins, those in construction are also turning to XR to find ways to improve output. AR and VR are being used to create 3D models of builds, minimising efficiencies and getting stakeholders on the same page before commencing a build. AR is also being used during construction to boost accuracy and site safety. Doubts around construction's future capacity may be challenging to alleviate, but housing suppliers can be more enthusiastic about the eye that firms are keeping on emerging technologies. The warm embrace of immersive tech should serve as a promising sign for the future, with a number of advances set to impact the industry. One of these exciting prospects is the use of 3D printing in building - which will likely be supported nicely by augmented reality for planning phases, and fit seamlessly with the rise of Building Information Modelling (BIM). Though likely some years away, housing providers can afford to have faith, with somewhat similar activity already being carried out by aviation giants Boeing. Construction is more receptive to innovation than ever before. Image by Antony Ginsbrook. Elsewhere, big data could allow for an enhanced understanding of the needs and desires of a rapidly evolving buying market. Artificial intelligence will divulge genuine value from the data, while also playing a part in further revolutionising the search process for buyers. The potential of blockchain in removing the horrifically time-consuming nature of completing property transactions, attaining survey information and title deeds will be a relief for all. Construction's warm embrace of innovation and technology provides those in property and housing with at least some reassurance that the future isn't entirely covered by stormy clouds. Indeed, most in housing plan to consider partnerships with property developers and local authorities within the next 12 months, as they look to explore whether a more united approach can help dissolve the barriers stopping them from more effectively tackling the deficit. As mentioned earlier, Home Group is a shining example of a housing organisation looking to leverage the expertise of others to better themselves. Recognising a responsibility to lead the charge against the crisis, they already employ numerous development partners. The appointment of an innovation partner is a demonstration of their intent to spearhead efforts to innovate in the property sector, whether this be in delivering new homes or identifying how we'll interact with smart homes in the future. But what the move shows more than anything is that leading companies in the sector are commissioning expertise to align innovation efforts to their goals more closely. This differs from development partnerships, where the concentration of partners is understandably on how to make themselves smarter. Ultimately, we should expect construction's new, innovative attitude to complement the efforts of those in housing and property. Organisations in those sectors should look to the movements of Home Group for inspiration. Failure to do so is likely to introduce an unnecessary burden on the construction industry, at a time when the key to tackling the housing crisis lies in collaboration.